Why would anyone want to burn Devil's Incense? Well, the obvious answer is that Demonolators and Satanists will find it a very pleasant prospect indeed, because it invokes the precense of The Devil and all his Imps. However, nice as such folks may be (and some of them are very nice indeed), the question remains — why would an average root doctor want to set these little Devils working in the air? Well, one reason is to cause harm and mischief in an area where people will soon be gathering. 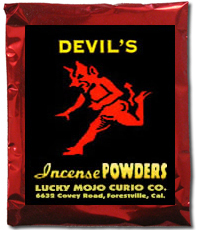 If you want to break up a meeting, a political rally, or a work-place, just go to the place early, light some Devil's Incense before anyone shows up, call upon the Devils to do their worst, and watch what happens. There will be fussing and fighting, shouting and shoving. In short, unholy Hell will break out. Good luck ... and stay safe.